Priced at $29 they were a steal and I snapped them up! Cornflower lemonade pitchers are hard to come by and I've seen them priced over $100. The glasses usually sell, individually, for around $10. There isn't a chip or scratch to any of the pieces. 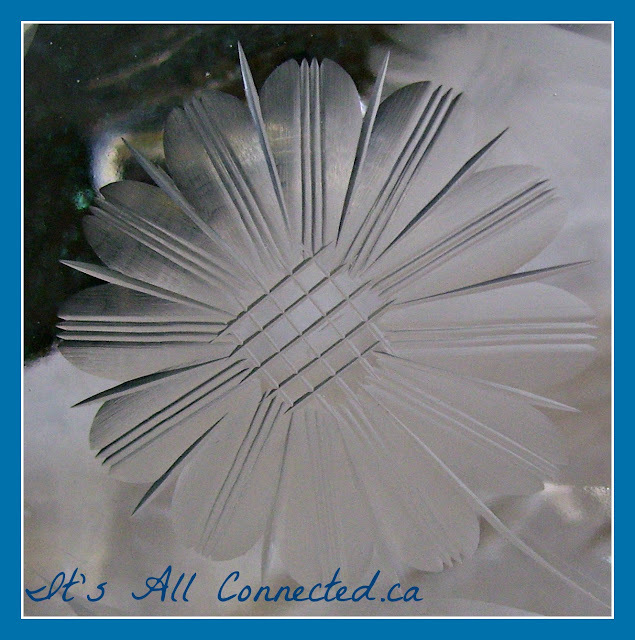 Cornflower is a pattern created by Canadian glass cutter WJ Hughes in 1912. For 75 years it was the favourite pattern choice for Canadian homes. 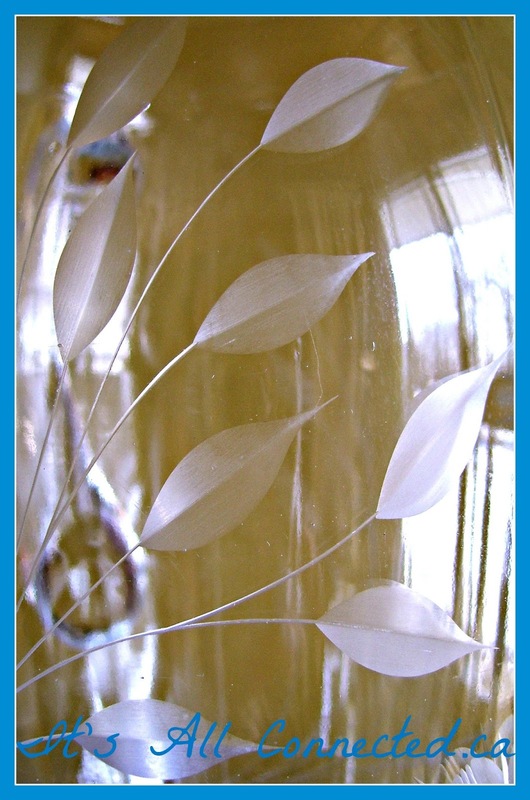 The Hughes Cornflower Co. specialized in cutting and embellishing glass and ordered their pieces from as many as 20 different glass manufacturers. Although it came from as far away as Europe, most of the pre WWII glass came from the USA. Some pieces are crystal. Others are ordinary glass. The rarest and most expensive, as collectibles, are the coloured Depression glass pieces. I remember this as my grandma's pattern. By keeping an eye out at my local Salvation Army Thrift Store, I've put together a set of 8 juice glasses for 50 cents each. Now that I have 8 tumblers and a pitcher, I can move on to wine glasses and serving pieces. I love this pattern. How cheerful! You were lucky to have found them, especially in that condition. Hi... Love your cornflower .. I see it often at the auction we attend.. I wonder what kind of tray you will find.. smile. Really beautiful! What a great find! Makes me think more frequent trips to my local Salvation Army thrift shop are definitely in order! I don't recognize this pattern from the old days. My mom never had any, I know that for sure. It's very pretty and I especially like the elongated leaves. Good buy! It is beautiful Maureen and a good deal. Lucky you Maureen. That brings back a flood of wonderful memories. My grandmother used to serve us lemonade under the willow tree using the same set. As a child I simply loved it all. Enjoy Maureen. $29.00 ... oh, what a deal. That set is just gorgeous and in such fine condition. Must have sat in a china cabinet all these years. Beautiful pattern too. I have been dealing in antiques for a lot of years, and do not ever remember seeing that pattern. Lucky you, Maureen. 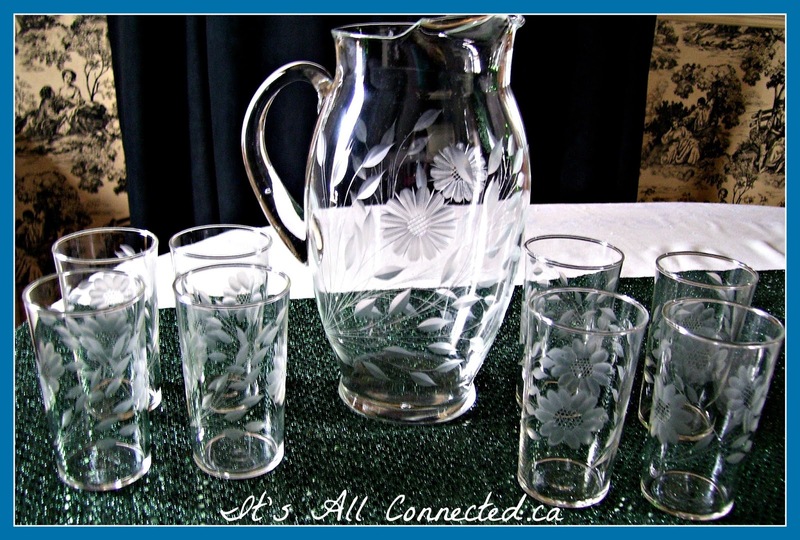 Thanks for sharing the history of that glass. I remember seeing these in almost every house growing up Maureen!!! Beautiful - and a great find! What a gorgeous treasure your found! Bravo! Oh, I love them, they are just precious! Is this the same cornflower that grows wild by the road in the US. We used to call them "Batchelor Buttons" or "Ragged Robins" and then of course "Cornflowers"! Stunning glass, I lve it!! Looks like the luck of the Irish came your way, with this fabulous find! Happy St. Pat's week to you. What a gorgeous set! The pattern is just stunning! Love it! I seem to be able to reply to your comment. The problem didn't start until I was a couple of weeks into Google+. People told me to delete it to fix the problem. Very beautiful Maureen. I have not heard of this pattern before, but I love it! 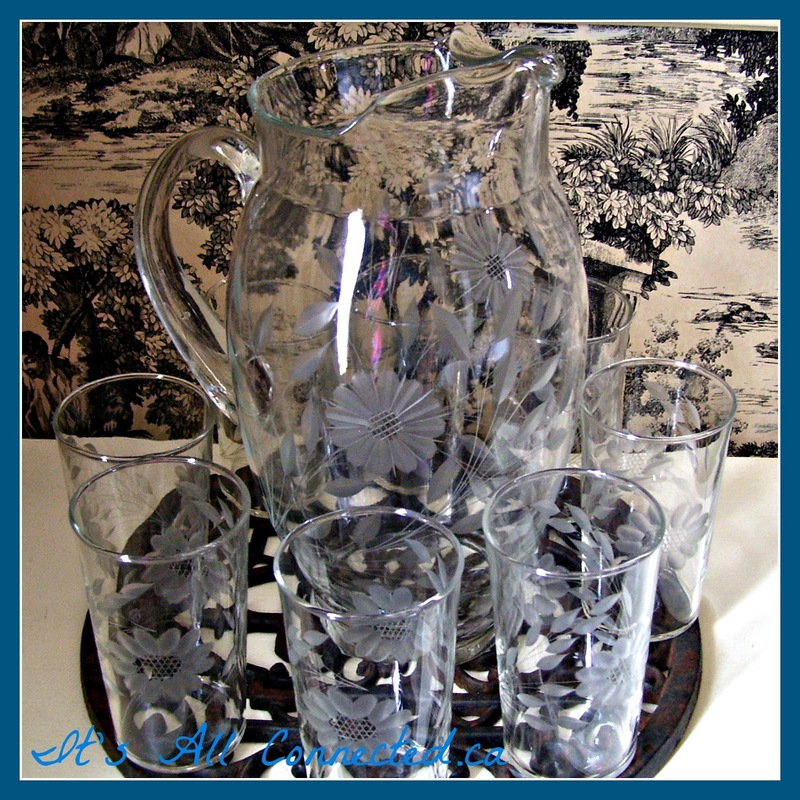 I love your new pitcher and glasses Maureen. I bet they would be perfect for lemonade on a hot summer day! What a wonderful find! The set is beautiful and to think your Grandma had this pattern is a treasure. Yes, I can see the pitcher filled with lemonaid this summer! Thrifting is so much fun! You certainly hit 'pay dirt' when you snatched up this gorgeous Cornflower set. I absolutely love that pattern and envy you with this wonderful find. You do it justice, I am happy for you. Hugs, Gayle. I love it when you teach me about stuff Maureen! That really is a lovely pattern and those leaves are just beautiful..the flowers too, but I'd have bought the for the leaves alone! Nice score and put something strong in that lemonade and I'll sit on your deck with you and watch the river roll! What a great find and thanks for the info! O, this is sooo pretty. Just beautiful, Maureen. Lucky you for being at the right place at the right time. I know you will so enjoy using it. So beautiful wow! and what a great price. Maureen -- what a lovely set. Looks beautiful in your home. I will be expecting to see some refreshing lemonade soon in that gorgeous set! What a beautiful find. Love to have some Lemonade with that set. Hope you have a good week-end. Peace In The Chicken Coop! Did We Save The Earth? How Did A Chicken Get In My Bathtub?